The benefits of a system that can look at people in an objective and quantifiable way are enormous. DISC gives you advantages that cross a whole range of business functions. Whether you're selecting a new candidate for a role, assessing someone who's already part of your organisation, or just finding the optimum approach for an individual, DISC can give you definite benefits and advantages. DISC has its roots in recruitment, and it's perhaps natural that that's the area where it remains most widely used. Because of its simplicity and cost-effectiveness, DISC makes light work of the recruiting process, making it practical and affordable to implement personality profiling across the board. Features like job matching can even help to highlight those candidates who closely match the needs of a role, at least in terms of their individual personalities. DISC can go further in this area, too. For example, best practice is to provide candidates with feedback on their performance, and a tailored DISC feedback report can do exactly that. For successful candidates, an understanding of their personal style can also help ease integration into the organisation, and with fitting their new role to their particular strengths. The usefulness of DISC doesn't end once a new recruit is in place. Far from it, DISC has a huge contribution to make as part of your ongoing assessment programme, as well as helping to address specific issues as they develop. Regular profiling keeps you informed about individuals' performance in their roles, giving you strategies to keep them motivated and working at their best. When management challenges arise, DISC can play a part there, too. Having a detailed grasp of a person's aspirations and preferences gives you the tools to understand and defuse a difficult situation, and with a DISC relationship assessment can guide you towards successful conflict resolution. One of the strengths of DISC is its ability to explain how two different personalities will interact together. DISC dynamics identify the positive features of any working relationship, as well as potentially problematic areas, and can even suggest approaches to help solidify a relationship. The same principles used in DISC relationship profiling can be used to develop a communication strategy tailored to an individual personality. Understanding another person's individual style gives you a powerful ability to build a constructive relationship in any setting, from training to sales to management. 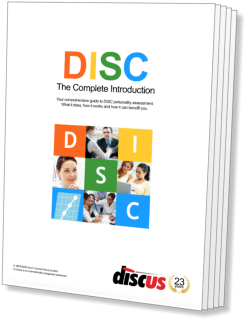 Relationships and communication are also key ingredients of a successful team, and DISC has a part to play here, too. With tools available to interpret and report on all the personality dynamics at work within any group, team building is a simple exercise. The same approach can be used to focus on leadership within a group, not only assessing leadership qualities, but even describing the kind of leadership needed by the group as a whole.